Collaborations - Workforce Edge Consulting Inc.
We believe that sharing knowledge among healthcare leaders is a priority to better support service delivery. Workforce Edge operates at the cutting edge of our field, incorporating our field experience, current research, and best practices in everything we do. As our sole focus is on healthcare workforce scheduling, we have developed a depth of expertise and have had exposure to the internally reported benefits from our clients. Among our best allies for knowledge dissemination are our client business leads and implementing managers, our past executive sponsors, and the executive teams who have held the vision. 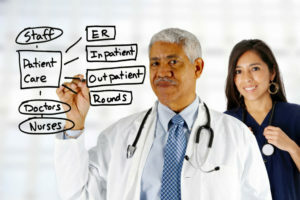 Another priority is building the urgency around the need to optimize staff scheduling environments in healthcare today. There are global policy issues with respect to the availability of the healthcare workforce shared across domains – be they countries, states, provinces or geographically dispersed private sector operations. Healthcare is facing common policy challenges including a shrinking workforce, changing patient populations, fiscal pressures to reduce spend without cutting service, and tighter quality and safety controls. These challenges lead to growing expectations as organizations get better at what they do. Our collaborations will work to stimulate and promote the dialogue on healthcare service delivery with an emphasis on workforce scheduling, shift planning, and staff scheduling arrangements. We collaborate with leading practitioner communities including policy strategists and healthcare leaders, across public and private acute health systems and long term care environments. We are also learning how to partner in a meaningful way with academic organizations and institutions in the development and application of research initiatives. We aim to bridge all communities through our collaborations and enhance the quality of information exchanges on these topics. We have a Strategic Alliance with the Canadian College of Health Leaders. The Canadian College of Health Leaders is a national, member-driven, non-profit association dedicated to ensuring that the country’s health system benefits from capable, competent and effective leadership. Le Collège canadien des leaders en santé est une association nationale sans but lucratif dirigée par ses membres qui s’efforce de faire en sorte que le système de santé du pays bénéficie de leaders capables, compétents et efficaces.